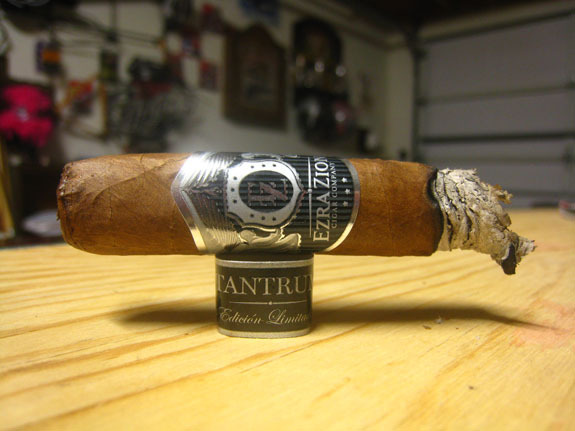 Ezra Zion Cigar Company is owned by the same guys (Chris Kelly, Kyle Hoover, and Alan Fonseca “the Don”) who are behind cigarfederation.com, a social media site with the mission to “be the world’s greatest social website for cigar Connections, Information, & Entertainment”. The site also hosts two excellent podcasts/webcasts (Half Ashed and Cigar Chat) that I watch on a regular basis. 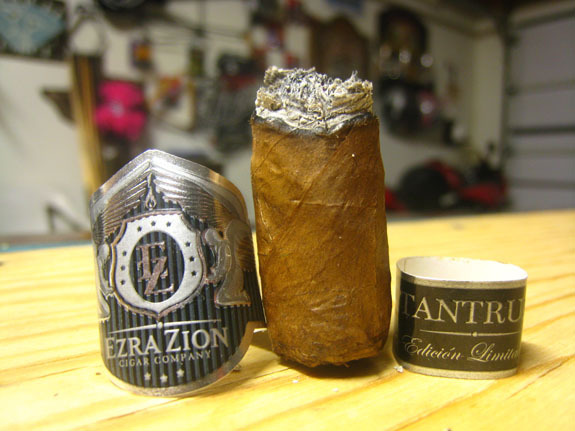 Ezra Zion Tantrum is 44 x 4.4 inch boxed pressed “Prensado Pequeno” and is presented in boxes of 28. It is a limited edition production of 1500 boxes annually and is made in one vitola. The retail price is $266.00 and retail individual price is $9.50. 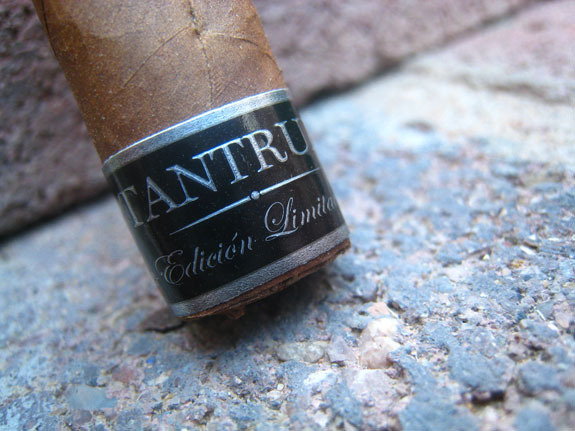 Tantrum pre-released in select retail locations beginning April 2013 and was released nationwide at the 2013 Annual IPCPR Convention. 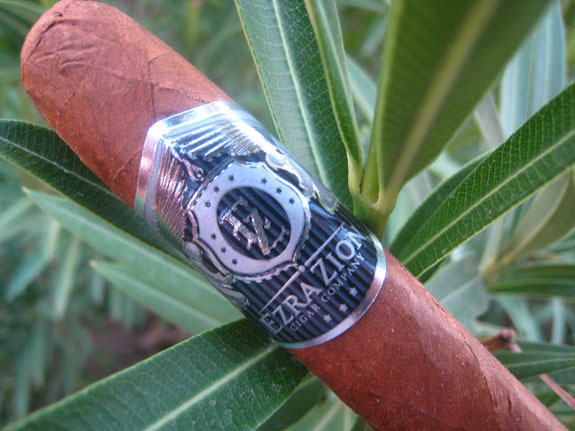 The design on the primary band can be found on all of Ezra Zion cigar lines with a couple variations in color. 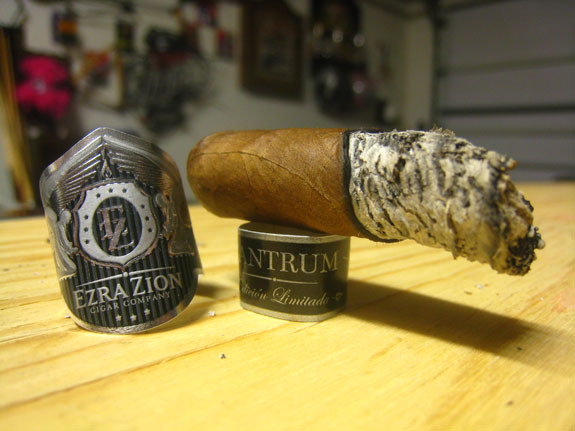 There is an amazing story behind the band design and the company name “Ezra Zion”. You can hear the story here at the 16:47 mark. Also, as with the other lines, the foot band distinguishes the line. This one being the Tantrum. The Tantrum wears one rustic wrapper. Instantly, I think of a Padron 1964 Anniversary Series Natural Principe due to the size and the rugged wrapper leaf. And trust me, that is not a bad thing. Veins and bumps can be found across the entire stick. 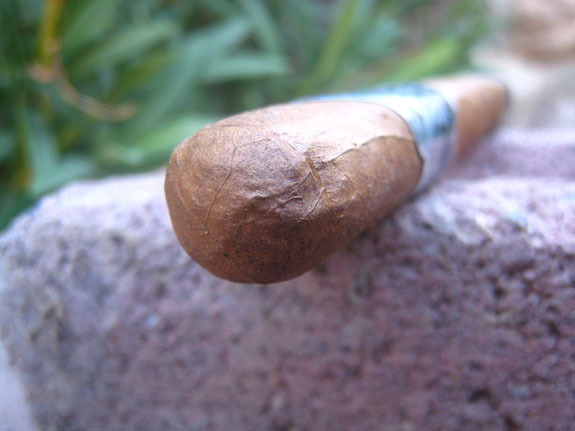 The Corojo Rosado wrapper is medium brown with a slight reddish hue. 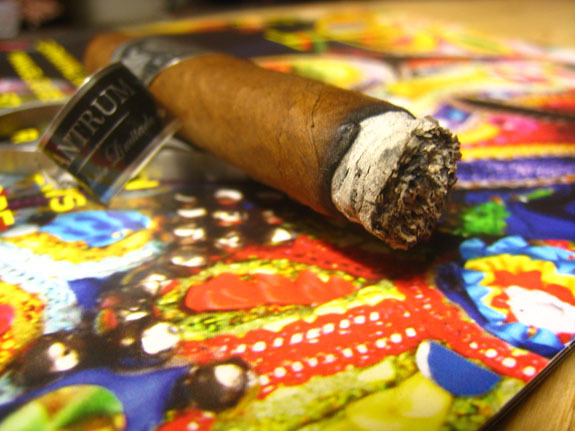 The wrapper has velvety feel and the cigar is evenly packed with a slight bit of give. The wrapper aroma is unbelievable. Notes of sweet honey contrast a musty cedar in the background. The foot is nutty, followed by the honey and cedar aromas that I pulled off the wrapper. A shallow clip has opened up a great draw that showcases rich tobacco, cedar, cinnamon, and a spice sting in the mouth and on the lips. After sliding off the foot band with ease, I am ready to light this Tantrum Edicion Limitada up. I absolutely adore the size of this cigar and the box pressed format is just one more plus. From the first few puffs, I can tell this is going to be one powerhouse of a smoke. The Tantrum is delivering an incredible amount of spice that is stinging the back of my throat. The flavors are full with the pepper in the forefront followed by cedar and a slight sweetness, along with a heavy amount of spice, lingers on the finish of the smoke. Three quarters of an inch into the cigar, the spice has calmed but by no means is it gone. The richness of the cigar is more noticeable as sweet cedar arrives on my palate that is complementing the spicy profile. The burn line is thick leaving behind a light grey, layered ash. As I burn into the second third, one side of the wrapper is having trouble burning. I am going to wait it out to see if it will correct itself. The retrohale, which was extremely sharp in the first third, has leveled out. The mixture of earth, cedar, and pepper makes the retrohale very enjoyable, but not recommended for a novice. A toastiness has joined the sweet cedar, as well as a mild cocoa and coffee. Each draw produces a copious amount of smoke. Sure enough, the burn has completely corrected itself. No touch-up was necessary. The strength is definitely full but not pushing me over the edge. Ash is flaky but still holding to ¾ inch. 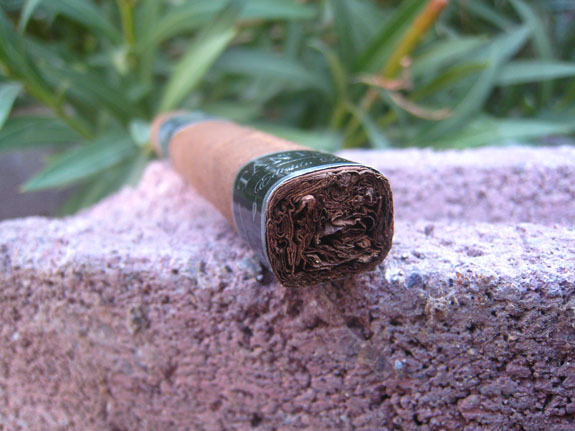 The band has been applied tightly around the cigar, so there is no way I can slide it off. However, the band comes unglued with ease. Another band for the collection! The spice is back in action. Almost a complete return to the start of the cigar. Once again my lips and mouth have a tingling sensation from the spice. On top of the peppery spice, there is an added layer of cayenne pepper. The cigar remains toasty with earth and leather notes and, as I put the cigar to the close, a tad bit of cocoa is still noticeable on the finish. As I mentioned, this cigar packs a punch and is worthy of its slogan “a little baby powerhouse”. I could care less about strength if a cigar doesn’t deliver in the area of flavors and performance, so it is a good thing that this cigar delivered in both. No construction issues were experienced and the burn line was solid, except for the minor burn issue in the middle third that quickly corrected itself. The full, spicy flavors grabbed my attention from the beginning and took me on a wonderful journey. When I first saw the price tag of $9.50 for a petit corona, I was immediately turned off. However, upon smoking the Tantrum, I was extremely impressed and would dish out $9.50 anytime for this stick. 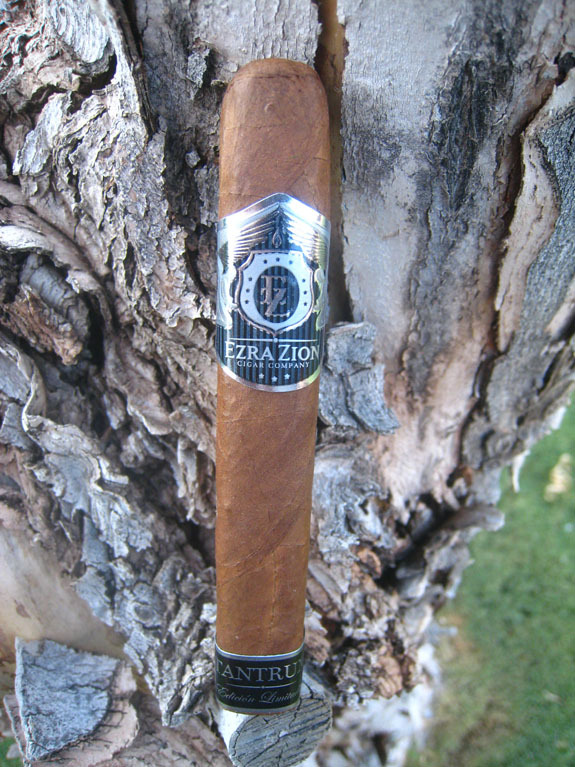 I want to give a big “THANK YOU” to Ezra Zion Cigar Company for providing the samples. If you have smoked the Tantrum, let us know your thoughts.